The site of Loughnaneane Park is a fascinating confluence of geographical and historical features which embody the physical, natural and cultural history of Roscommon. The town park designed by Murray & Associates incorporates this rich heritage with sculptural forms to create a modern facility for the people of Roscommon. The structure of the park is based on a main avenue which is intersected by an elliptical lake. 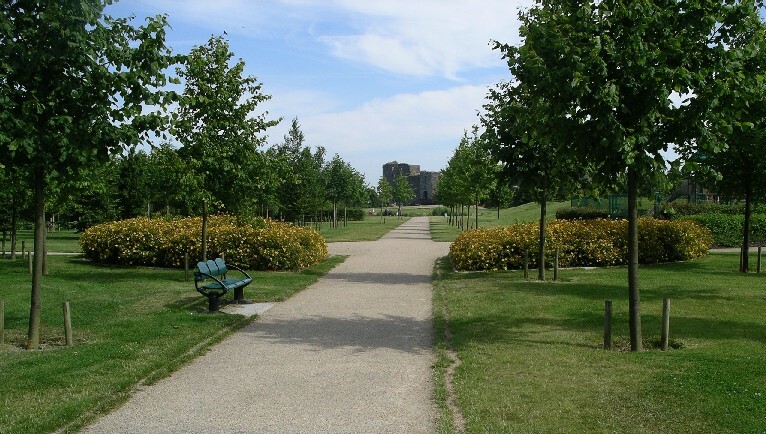 The avenue is orientated to visually connect Roscommon Castle and Roscommon Church, two of the most significant architectural features of Roscommon town. The avenue is flanked with Lime trees and meets a viewing deck on the edge of an elliptical lake. 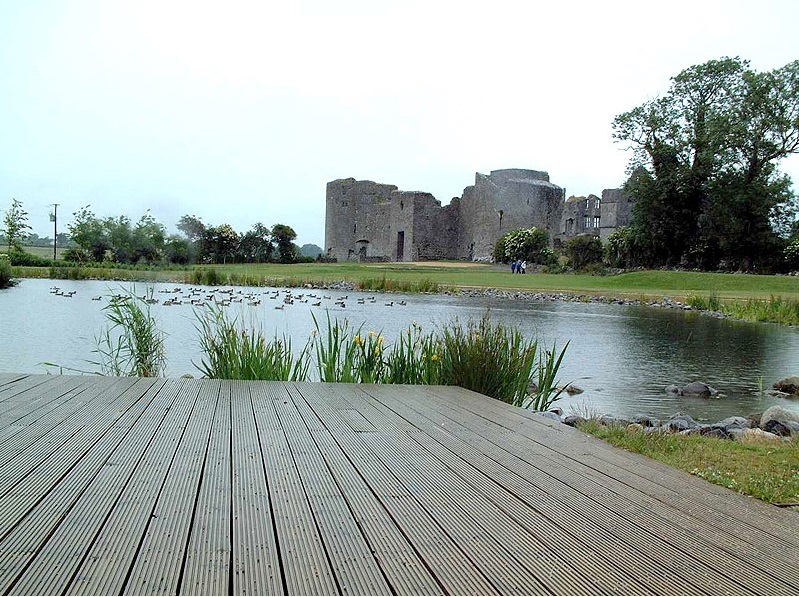 The lake serves to enhance the view of the castle. Arcs from the lake are extrapolated to create the secondary structure of the park. These arcs form a dynamic pattern which provides the layout for paths, mounding and planting. The layout is strongly geometric and features are fitted within the overall structure. 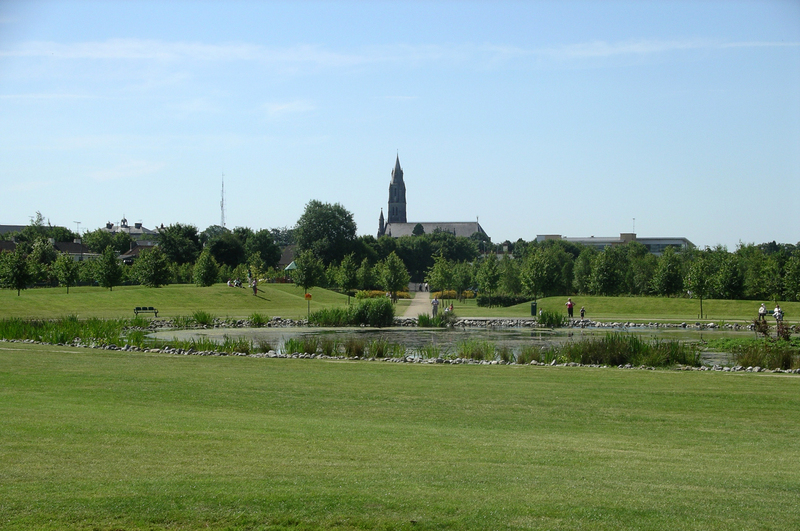 The paths link the park spaces and features and create walking routes within the park. Seating is provided at key junctions and at regular intervals throughout the park. 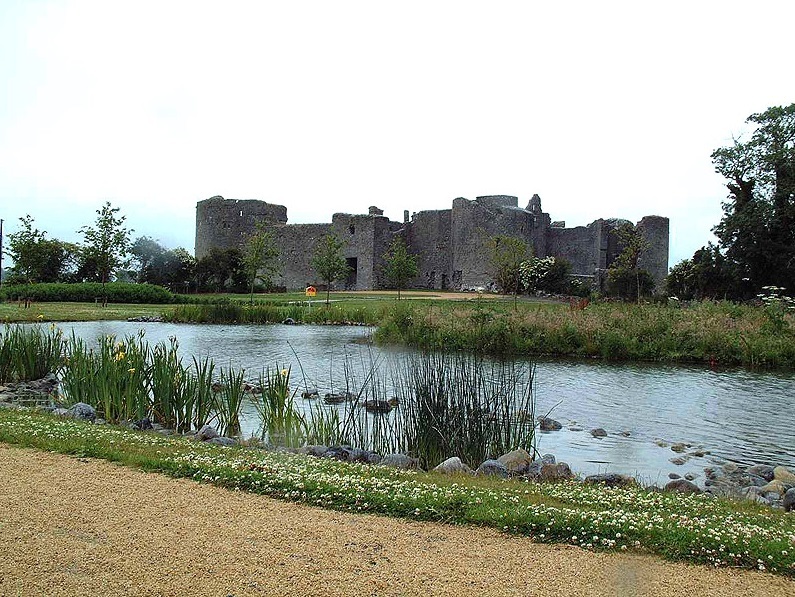 The main avenue of the park focuses visually on Roscommon Castle, one of the most magnificent ruins in Ireland. The path swerves in a wide arc from the viewing deck around the lake edge to bring the visitor to the castle. 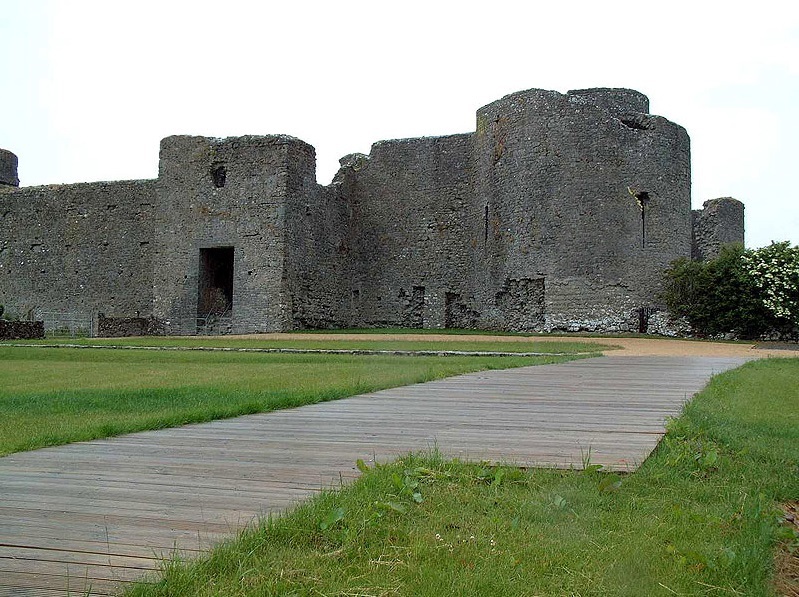 The approach to the castle is marked with a wide, curving timber surface. A raised terrace, paved with golden gravel and grass, defines the interface of the castle with the park. Another archaeological feature of the site is the ‘Hill of Bones’. The history of this part of the site is not known but there are numerous local tales regarding its mysterious past… This has been enclosed as a meditative grove of birch trees and fern within the park. The natural features of the park are also highlighted. A turlough occupies the western part of the site and is managed as a wildlife conservation area which is a habitat of unique flora and fauna. A deck is provided for visitors to view the wildlife and views beyond. There is also a swallow-hole on the site, a remarkable feature of limestone areas which is enhanced by placing limestone boulders in an elliptical form. The landscape design utilises sculptural forms and careful selection of tree and plant species to evoke images of the landscapes of the past. Large mounds are aesthetically reminiscent of Neolithic earthworks whilst providing an interesting change in level in a flat site and helping to define the central area of the park. The planting scheme is designed to complement the overall layout. Boundary woodland planting defines the northern, western and southern boundaries. Within the park, groups of native and naturalised trees are arranged in grid patterns flanking the pathways. These create strong spaces within the park and provide visual interest. The park also features a children’s play area, car park and entrance areas. Murray & Associates also designed the steel entrance gate details. 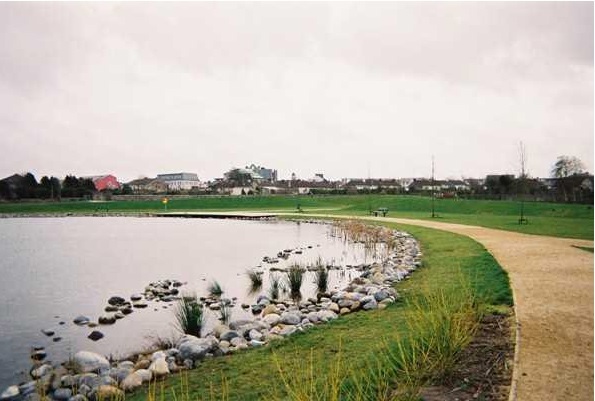 The development of Loughnaneane Park is first and foremost a public amenity for the people of Roscommon to enjoy. It accommodates walkers, nature enthusiasts, families and tourists. It also has an educational role in relation to archaeological features, native flora and fauna and the natural processes and features of the area. The park will also protect the existing environment and wildlife of the area.